But I'm game to get some Imperial Purger, Tatarus Swarm, Gore Typhon and Jotun as well on an off day, like Wednesday or Thursday. Yea I'd like to do that it sounds like a great idea. I'm down to do more Enclave raids. That was the first one I've done so I still need 390 points for Azure Reaper. I'll help with them too after I've got enough honor. And I'd do any other raid I guess since I haven't done any others. I'd be up for that, my schedule on mondays is gonna smooth out now and Ill be home for a 4 or 5 pm central start for the next month on mondays. As to other raids, let me know which one, and I will try to throw together a deck for it. I know I can make a deck for Gore typhon, Tartarus swarm, and oluth. With the recent unlockings, I might be able to pull together some others as well, but haven't really checked yet. I've still not unlocked Jotun yet sorry. I like the monday raid on flagship, im just thinking we might also be able to add another on maybe wednesdays or thursdays, i seem to remember last week we did imperial purger, and it went quite well. 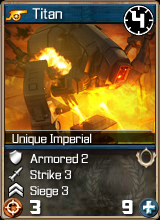 and if im not mistaken it provides a good card with the hellion. Thoughts/ opinions? DarkenedOne wrote: I like the monday raid on flagship, im just thinking we might also be able to add another on maybe wednesdays or thursdays, i seem to remember last week we did imperial purger, and it went quite well. 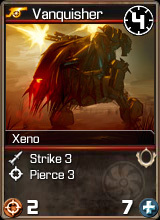 and if im not mistaken it provides a good card with the hellion. Thoughts/ opinions? I saw this, and that's why I started that Imp Purger. I went ahead and opened it up in the general Tyrant forum. Have you gotten your Azure Reapers yet? They prove quite fruitful in the Jotun raid later. I'm done with Imperial Purger and just slight off of 1000 on Enclave Flagship (not that I want that last card anyway)... But what other raids do you want/need help with? I'd really like to focus on the Jotun raid to get Rhino and Hephatat.